Highbury Poultry is a chicken processing business based in rural Shropshire. Trading for well over half a century, Highbury Poultry has earned a reputation for producing quality fresh and frozen British chicken. We are a AA Grade BRC (version 7) site. In the last 50 years the business has grown and developed with the ever changing marketplace, without compromising our traditional values. It is now a modern manufacturing and distribution operation employing 150 people with a turnover in excess of £35m per annum. Being part of a large group has allowed an ongoing programme of continual investment in processing and infrastructure that has delivered greater efficiencies in the business. This in turn has allowed us to ensure that the standard of our process remains ahead of our competitors and surpasses our customers’ expectations. If you are looking for a quality producer to complement your business then look no further than Highbury Poultry. 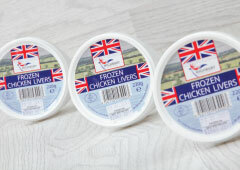 We offer fresh and frozen quality British chicken from a modern production facility with a reputation for taste and quality second to none.